To hear it from the White House, and from Israel’s leftist media, Defense Minister Moshe Ya’alon is a major liability. As half the planet now knows, Ya’alon is harshly critical of US Secretary of State John Kerry’s persistent efforts to force Israel to surrender its land and ability to defend itself to the PLO. 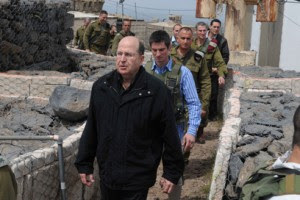 In a private conversation that Ya’alon did not expect to be made public, he criticized Kerry’s so-called security plan that offers Israel advanced technology in exchange for PLO control over its eastern border. Ya’alon also rejected the notion that the PLO is interested in making peace. And he stated the inconvenient fact that PLO chief Mahmoud Abbas is only in power because Israel has security control over Judea and Samaria. Ya’alon also said, again in a private conversation, that Kerry’s razor-sharp focus on Israel and the PLO owes to an “incomprehensible obsession,” and that by neurotically pushing for a deal that has no chance of being concluded or achieving peace, Kerry is exhibiting “messianic” character traits. It is hard to think of harsher criticism than Alaweed’s. And yet, the administration had nothing to say about it. Neither he, nor his fellow Saudi prince Bandar Bin Sultan al-Saud, the Saudi intelligence chief who said last month that he is scaling back intelligence cooperation with the US, was personally attacked by the administration. No umbrage was taken at their statements. And again, their public statements were no less harsh than what Ya’alon said in a private conversation about Kerry. Neither the Israeli people, nor the US’s traditional Sunni Arab allies support Obama’s policies in the region. They believe Obama’s policies are dangerous for them, and antithetical to US interests. Indeed, Ya’alon’s assessments of the administration are not only in line with regional opinion, the vast majority of Israelis share his views. According to a poll published last week by Makor Rishon, 80 percent of Israelis think that Kerry’s peace plan has no chance of bringing peace. Seventy-three percent oppose his security plan for the Jordan Valley. And 53% object to the entire premise of his talks – that Israel should surrender almost all of Judea and Samaria to the PLO. Moreover, the average man on the Israeli street sees the destruction wreaked by the Obama administration’s policy throughout the Middle East, and he cannot figure out what Kerry wants with us. Syria is a humanitarian and geopolitical nightmare with global implications. Rather than do everything possible to strengthen moderate forces in Syria, like the Kurds, and cultivate, train and arm regime opponents who can fight both the Assad regime and al-Qaida rebels, Kerry has devoted himself to demanding that Israel release more Palestinian terrorist murderers from prison. Rather than protect Lebanon from the predations of Iran and Syria to ensure its independence, Kerry is holding marathon meetings with Netanyahu to try to coerce him into helping the PLO build another Jew-free terrorist state in Judea, Samaria and Jerusalem. Rather than try to blunt the growing power of Hezbollah – Iran’s terrorist army – in Syria, the US’s policy is inviting Iran, the party most responsible for the war, to join the phony peacemakers club at Geneva. As for the rest of the region, from Tunisia to Bahrain, from Egypt and Libya to Iraq, and Yemen, Kerry and the Obama administration as a whole are content to watch on the sidelines as al-Qaida reemerges as a significant force, and as Iran undermines stability in country after country. Then of course, there is Iran itself, and its nuclear weapons program. After the six-party nuclear deal with Iran was concluded on Monday, Iran’s leaders declared victory over the US. They boasted that the most dangerous components of their nuclear weapons program are unaffected by the deal they just concluded with the Americans. They laid a wreath on the grave of Hezbollah arch-terrorist Imad Mughniyeh, who masterminded the 1983 bombing of the Marine barracks in Beirut that killed 243 US servicemen. And they forced Lebanon’s Sunnis to accept a Hezbollah-dominated government. For its part, the Obama administration continues to insist that the greatest threat to peace is the US Congress, because its members wish to pass an additional sanctions bill against Iran that would only come into force in a year if the Iranians do not abide by the agreement. The only parties whose lot is improved by the Obama administration’s Middle East policies are Iran, the PLO and the Muslim Brotherhood. But none of them will praise those policies, because they all hold the US in contempt. This is why the Palestinian leadership continues to incite against Israel and reject the Jewish state even as the US is acting as their surrogate in talks with Israel. This is why the Iranians mock the US, even though the White House just cleared the way for Iran to develop nuclear weapons, and develop its economy and has allowed it to take over Iraq and Lebanon, and defend its puppet regime in Syria. This is why the Muslim Brotherhood condemns the US even as the Obama administration upended the US alliance with Egypt in order to support the Muslim Brotherhood. The Obama administration has responded to these demonstrations of contempt and bad faith with extreme reticence. Either it issues written, general condemnations, or it claims, as in the case of Palestinian incitement, that it doesn’t believe it is productive to publicly criticize the Palestinians. Given this behavior, the Obama administration’s response to Yediot Aharonot’s publication of Ya’alon’s private statements can be fairly describe as apoplectic. It was also mean-spirited. In other words, the Obama administration just accused Israel of ingratitude. But there is nothing ungrateful about Israel’s treatment of the US. Americans are getting the same message from allies throughout the Middle East. Under Obama, America’s regional policies are so counterproductive that the US has come to be seen as the foreign policy equivalent of a drunk driver. As the US’s strongest ally, and also as a country that has depended for decades on US support, Israel is a passenger in the back seat of the car. On the one hand, we are happy for the ride. On the other hand, the administration’s driving is endangering our survival. It is only because our leaders are grateful to the US for its support that the government is going along with Kerry’s ridiculous peace-processing. More importantly, what is gratitude, exactly? Is it shutting up and watching your closest friend drive both of you over a cliff? Of course not. To be a good ally – and a grateful one – requires you to warn your ally when his actions are ill-advised and dangerous. And that is precisely what Israel has done. Israel’s behavior is the definition of proper behavior. Aside from being dead wrong, the anti-Semitic undertones of the administration’s castigation of the Jewish state as ungrateful are hard to miss. These words, and nearly identical ones intoned by Carney, play into the anti-Jewish stereotype according to which Jews are quarrelsome but hapless wretches. The flipside of this stereotype is the all-powerful Jewish conspiracy that manipulates non-Jews into doing its dirty work. That slur reverberated strongly in the administration’s condemnations of Netanyahu and US Jewish groups for advocating the passage of additional sanctions against Iran. In both cases, the White House’s message is the same. Unlike other groups critical of US policies, Israel and supporters of the Jewish state have no right to speak. Presumably the administration’s resort to these anti-Jewish tropes is inadvertent, but the fact that they have been used repeatedly is deeply disconcerting, and bespeaks, at a minimum, alarming insensitivity. Under tremendous pressure from the administration, Ya’alon apologized for his leaked remarks and Netanyahu took to the Knesset podium to praise Israel’s ties to the US and thank the US for its support for Israel. But this was not enough for the Obama administration. They want Netanyahu disavow Ya’alon’s thoughts and withdraw the defense minister from the negotiations. In other words, the Obama administration is using Ya’alon’s private remarks, leaked by an unidentified source to a newspaper with an anti-Netanyahu editorial agenda, as a means to neutralize the most powerful voice opposing Kerry’s obsessive, messianic behavior in the Israeli government. They want to use American umbrage at the tone of Ya’alon’s private statements to upend Israeli policy and force Israel to embrace the substance of the Obama administration’s delusional and destructive actions. And to advance this goal, they are using anti-Semitic signals to castigate Israel and deny it the right to speak on its own behalf. Israelis love America. And for that reason, it is compelled to do what anyone strapped into the back seat of a car driven by a drunk would do: try to convince him to stop driving. As a grateful ally of the United States, Israel should publicly tell the Obama administration that what Ya’alon said in private is the truth. And yes, sometimes the truth hurts.